Linton is a rural town on the Glenelg Highway, 30 km south-west of Ballarat. Linton was first occupied for pastoral purposes in 1838 by Joseph Linton. His pastoral run was known as Emu Hill or Linton’s but, more importantly, the name of Linton’s Diggings was given when gold was found on the property in 1854. Several leads were discovered a few kilometres north of the initial discovery, and in 1860 a township was surveyed in their vicinity, adjacent to Springdallah Creek. The township had a population of 382 and the diggings had over 1500 people, indicating that the survey was based on an existing settlement which had two hotels, a blacksmith and a butchery. Several shops and a bank moved from the Diggings to the town in the following year. Schools were opened at the Diggings (1856) and the near vicinity (1861, Wesleyan and 1862, Anglican). 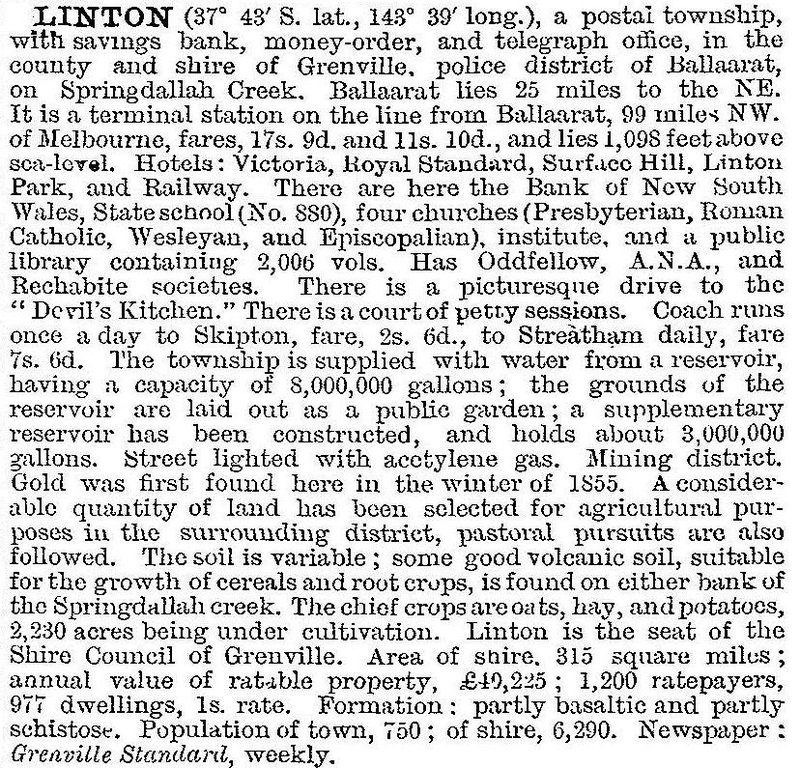 They were superseded by the government school at Linton in 1867. Almost immediately after the survey of the township, Anglican, Catholic and Methodist churches were built and a court house was opened. The hall and offices for Grenville shire were opened in Linton in 1865. A public library was opened in 1874. Linton has a large rural hinterland west of Ballarat, and it was the principal town in Grenville shire. Although the town’s population fell to about half its figure of 1881, three or four hundred people sustained sporting clubs, churches and the bush fire brigade. Pine plantations have been planted in the State Forest areas, mainly north of the town. The forested areas are at risk of fire, and in December 1998, five CFA fire fighters from Geelong West lost their lives when mopping up a relatively routine outbreak. The township was barely touched. Linton has Anglican and Catholic churches, a school (26 pupils, 2014), a general store, a hotel, a recreation reserve and a bowling club. The main thoroughfare, Sussex Street has many heritage buildings. The railway line was closed in 1985 and has been made a rail trail.